As a couple and family therapist, a common issue I experience is trust. I have heard about trust issues in couples that have only been together for a couple of months, and couples who have been together for several years. The issue of trust can range from not trusting your partner’s response to your hard day of work, to breaches of trust with infidelity. Although building trust may seem like a daunting task, it is definitely possible to increase trust to a sustainable level in your relationship. Through my time as a couple’s therapist, I have understood five major things that will help build trust and security within your relationship. A large element with building trust is taking responsibility for the pieces in which you are responsible for. If you were a reason that the trust was broken in the first place, it is important to express remorse and to continue to be transparent about where you are and what you are doing. If you are not the reason for which trust was broken, it is important to take responsibility for other elements in the relationship that may lead to there being a lack of trust in the relationship. Being open and honest about your thoughts and feelings is something that definitely requires trust. There is an element of you knowing that what you are about to share will be kept safely with the other person and that they will have limited reactions and an appropriate response to what you are sharing. However, the flip side is that working on increasing open and honest communication leads to more trust in the relationship because you will each feel more comfortable with one another. When you and your partner have decided to participate in open and honest communication with one another, it is important to build understanding with each other’s perspectives. Couples tend to build trust and security when they feel that their perspective is safe and understood by their partner, whether their partner agrees with their perspective or not. A helpful tool to demonstrate understanding is active listening. At its root, active listening is allowing your partner to speak without interruption, repeating back what you are hearing from them, and checking-in to make sure that they feel understood. Being a reliable partner is very important when working toward building trust, as reliability builds predictability. When you are being a reliable partner, you are communicating that they can trust that you will be there for them, you will do the things you said you would do, and act the way you promised to act. As you continue to be reliable in your relationship, you will have more opportunities to build trust and be involved in a deeper relationship with your partner. When you do not trust your partner, a lack of connection in the relationship often takes place. It is important to continue to build the connection with your partner, even when the trust is broken. Increasing connection can be done in ways by engaging in activities or discussions that make you feel good about the state of your relationship. This may also include making sure that your needs are being met by one another. 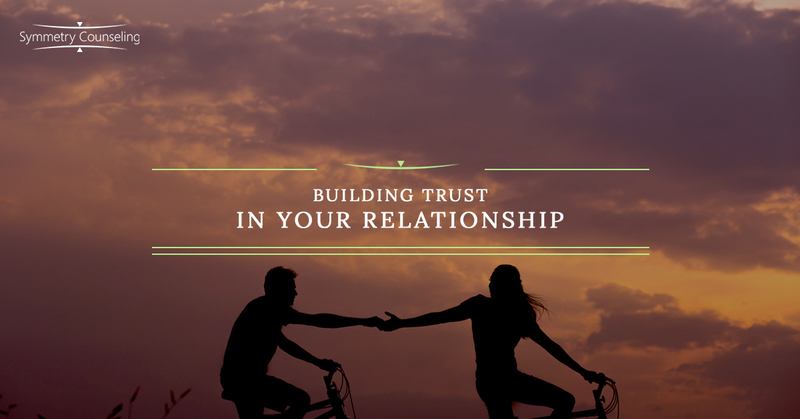 Whether it is in a new relationship or an existing relationship, building trust can definitely be challenging. If you feel that you are struggling with establishing trust and security in your relationship, it may be helpful to connect with a therapist! Contact Symmetry Counseling today to get in touch with one of our talented clinicians.